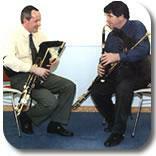 Brian McNamara is the eldest member of the renowned musica l McNamara family of Carrickavoher, Aughavas, Co. Leitrim. In 1979 at the age of 12 years old he was first introduced to the Uilleann Pipes by family friend Peter Maguire, a native of Mullahoran, Co. Cavan. Before receiving his first piping lesson from Peter, Brian had previously learned to play the Tin whistle under the guidance of his father, well known flute player Michael McNamara. His first set of pipes was also made by Peter. Throughout his musical life Brian has always expressed his great indebtedness to Peter for everything he has selflessly given as pipe-maker and teacher. Pipe tuition from Peter together with the strong musical influence of his family meant that Brian rapidly became an accomplished piper. He remembers fondly his experiences attending workshops in Miltown Malbay during the early 1980s and the influential tuition of a number of fine tutors. In addition to the influence of the music of older pipers, he was always a big admirer of contemporary pipers including Liam O'Flynn as he mastered his instrument and developed his own style. During the 1980s Brian competed at Fleadhanna Cheoil and other musical events winning many All-Ireland titles at Junior and Senior level. He became a regular member of concert tour groups and has travelled extensively as a musician. He has become a regular tutor at workshops and Summer schools nationally and internationally and a frequent performer on the national and international stage. In 1998 he produced and performed on the award winning album 'Leitrim's Hidden Treasure'. This recording featured Brian and other members of the McNamara family in a recording which gave exposure to a unique repertoire of music associated with South Leitrim. Brian subsequently launched his debut solo recording 'A Piper's Dream' in 2000 to widespread acclaim.